It might seem like I travel a lot, but in reality, I get a couple of long-haul trips in each year – sometimes to Hong Kong, for work, or maybe to Europe to visit family. This trip is an absolute anomaly – a compelling reason for work came up for me to be in Oslo for a couple of days, and rather fly there and back in such a short space of time, I tacked on a couple of days visiting family in the UK as well. I’m lucky with work travel in that I can work directly with our travel agent to configure itineraries and carriers that work best for both my employers AND my needs – whether that’s routings, costs, timetables, or alliances. This review is going to cover off my research and thought process for choosing British Airways, the experience of flying with Europe’s only carrier left operating flights to Australia, and dealing with a trip with 50+ hours of travel vs 80 hours on the ground. 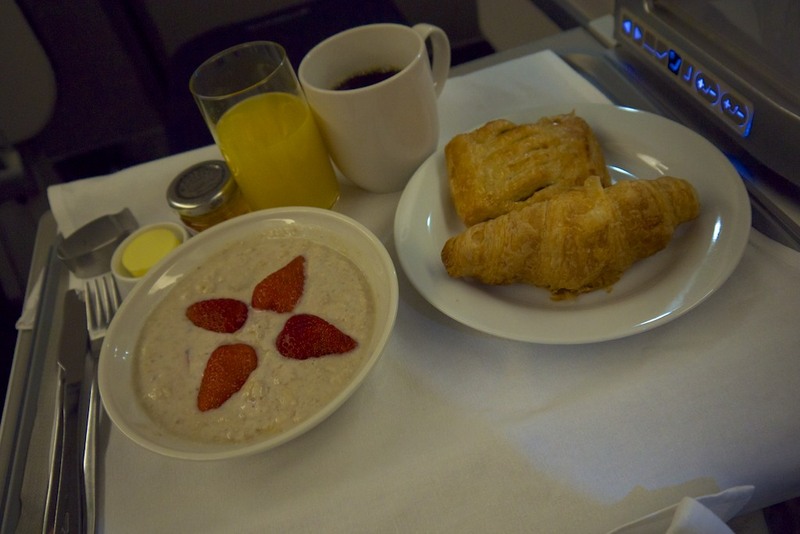 I’ll cover a few pictures and thoughts on the intra-Europe travel experience on British Airways too, but in a separate post. 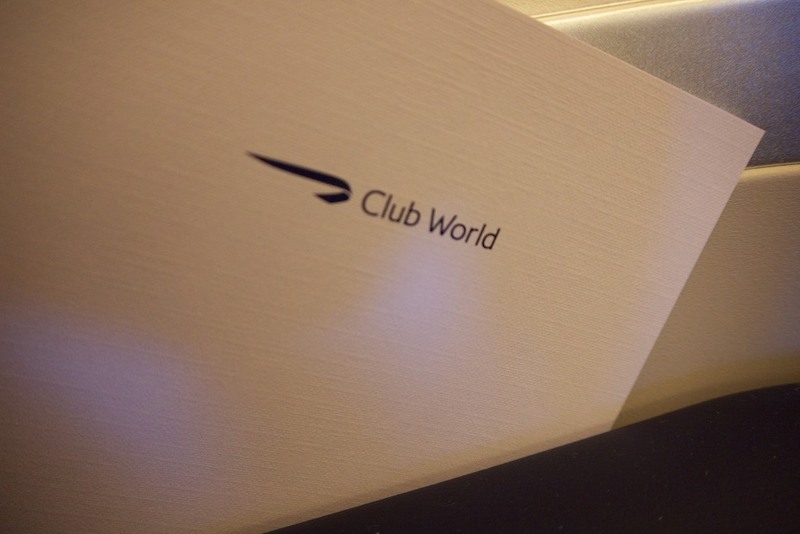 This one is specifically focused on British Airways Business Class (Club World) to London, via Singapore, and back. I usually cover my thought process on how I settle on a specific flight up front, but this process was a bit different, given no points were being used. I’ve still gone into detail, but the research and booking thinking is at the end of this post. This flight was booked about two weeks before travel, and the seatmap showed that only a handful of seats were free. 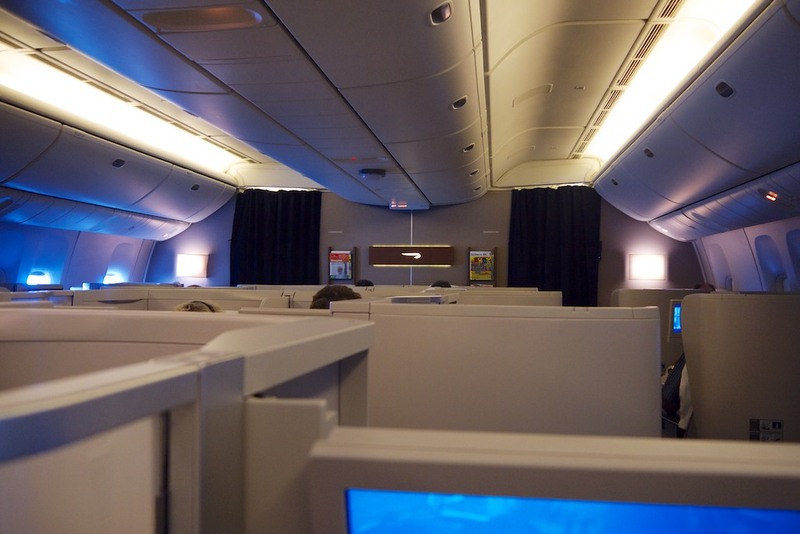 British Airways Club World has their long-standing configuration of alternating rear and forward facing seats across the plane which ends up being a 2-4-2 configuration. The window and middle seats face backward while the aisle seats face forward. The key thing for me was to avoid being in a middle seat where (when travelling alone) you’re essentially sitting immediately next to someone you don’t know. My top choice would have been a window seat as this gives much more room to spread your stuff out, but there were only a couple of aisle seats left so I grabbed one in advance of the flight. The seat I managed to grab was in row 13, about halfway down the cabin. This location was fine, but I would have much preferred a window if given the choice. 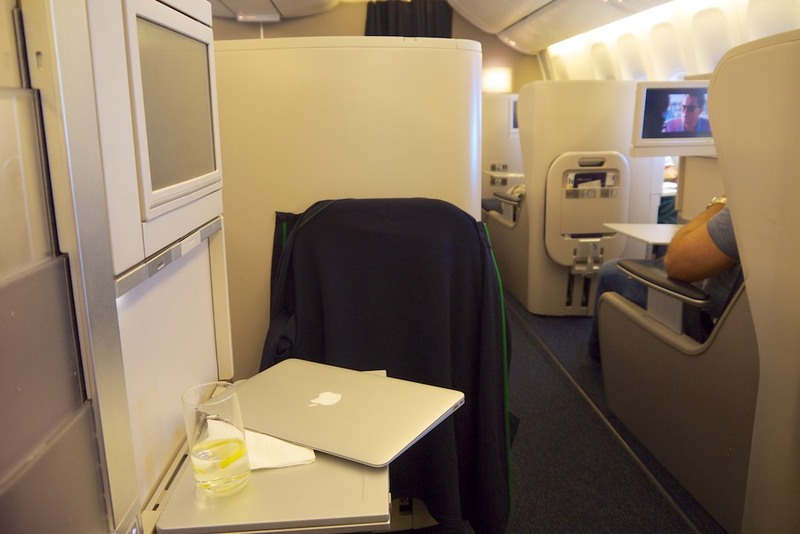 I’ve previously covered sitting in a middle pair seat in this review of British Airways 747 between New York and London. All was on time for the 3.30 departure, and after spending about an hour in the Qantas lounge, I dashed off to board and was one of the last on the plane. On settling in I could clearly see that this was a full flight, as predicted by the limited seat selection, and after take off I got settled into some work on my laptop to keep me going through to the late evening arrival in Singapore. Unfortunately the laptop power in my seat either wasn’t working, or didn’t play well with my MacBook Air – something to look into if you’re consider a flight with BA and planning to rely on in seat power. I managed OK until I got to the Qantas lounge in Singapore for a top up. The seat itself comes with minimal storage for your stuff. There’s a small tray for shoes or other bits, and a document sleeve to your side on the footrest in front of you, but that’s about it. It’s pretty paltry, simply because you are so exposed to aisle traffic that there’s just nowhere really to put anything like a small bag. Everything just gets in the way of something else. The aisle seats are also lacking in any kind of privacy at all, so not only do you have minimal space, and I ended up hanging a foot or knee out in the aisle every so often, but everyone can see you too. It wasn’t the best. There’s the infamous seat divider which comes up and down to allow you to not look into someone else’s face for 22 hours of travel. For the uninitiated, the control is on the top of the dividing partition. 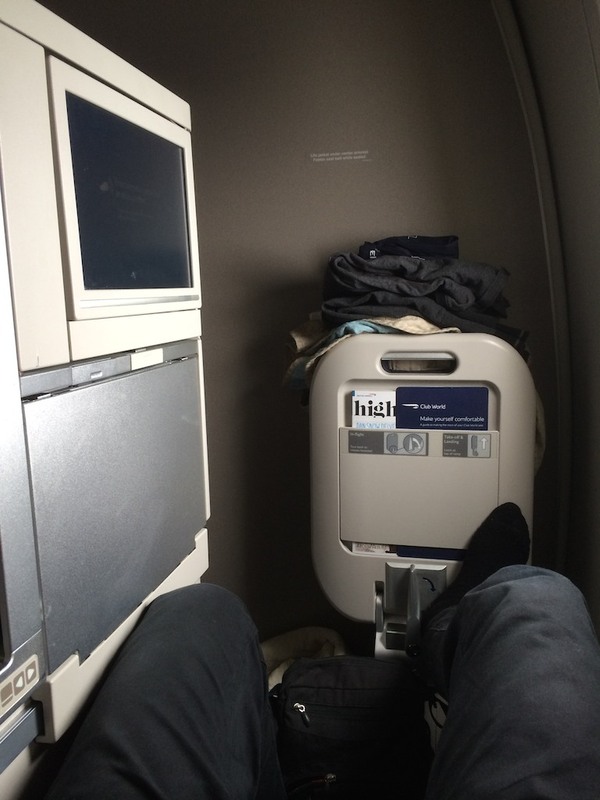 The Business cabin itself is actually fairly nice – these 777’s are relatively new and 3 out of the 4 flights had a clean seat with no scuffs or scratches. One of the seats I ended up on the return was pretty dirty unfortunately – but nothing some better cleaners couldn’t resolve. 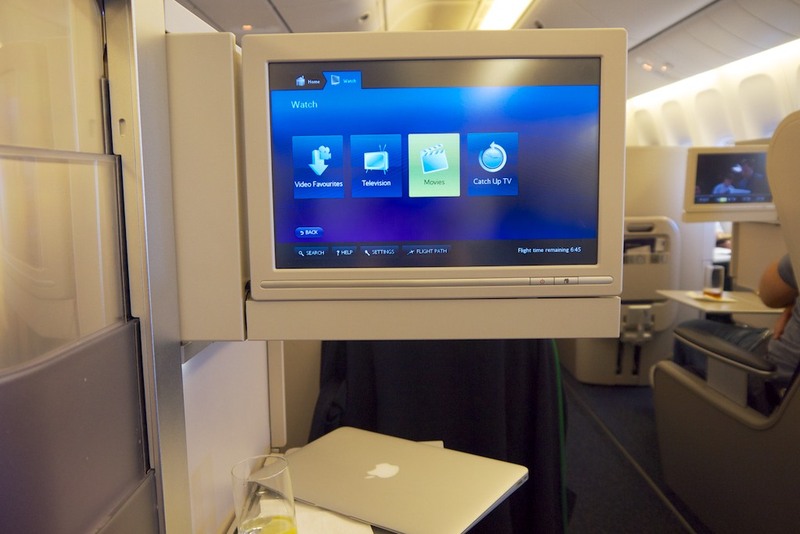 The inflight entertainment system was easy to use and loaded with a middling selection of content – it was good, I watched around 4 movies on the trip altogether, but found it hard to find these 4 to suit my tastes. That’s pretty personal though, and the selection was generally fine, while the system itself was responsive, simple to use and with a large screen. 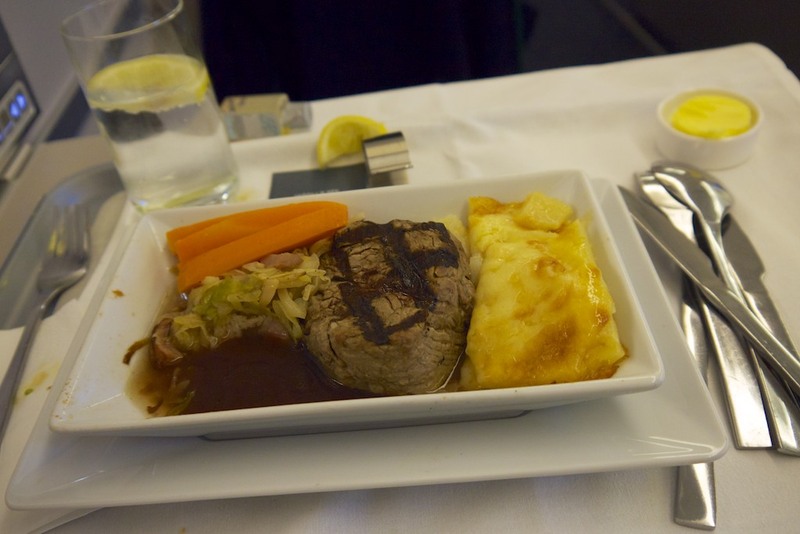 Out of Sydney, a dinner-time entrée, main meal and dessert was served, along with a snack before arrival into Singapore. On the flight from Singapore to London I was completely shattered after the long day and working on the flight up from Sydney. 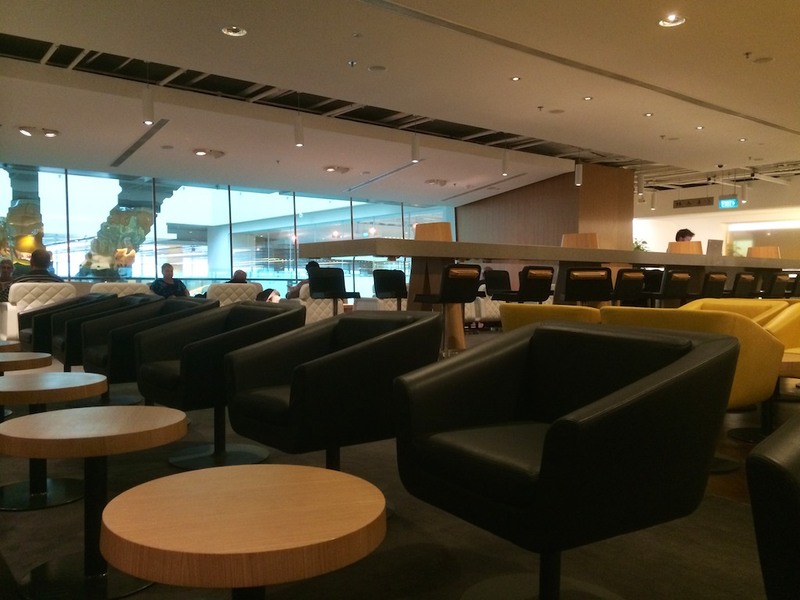 I used the Qantas Lounge in Singapore to grab a snack before then crashing on the Singapore to London leg. However, I didn’t ask the crew to save me a specific dish – though did mention I’d like some food later on. 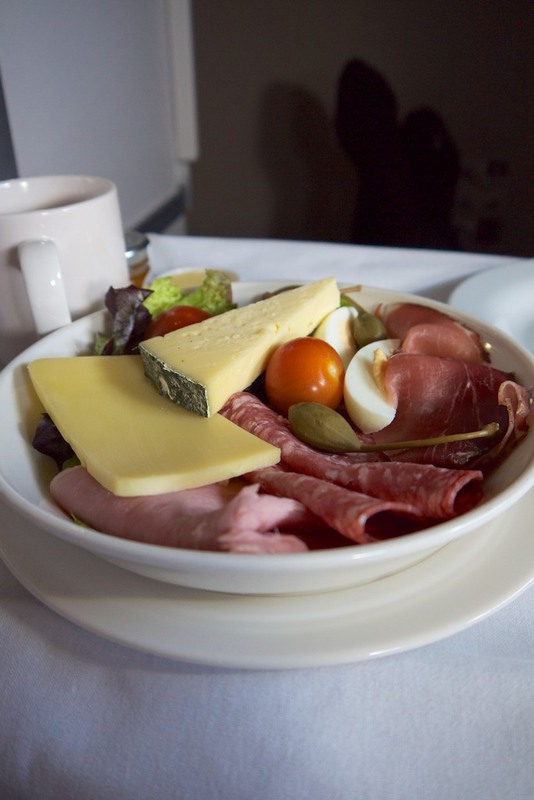 Unfortunately this meant nothing was actually kept for me, so I cobbled together a mid-flight snack when I woke up from some leftover entrées, salads and bread, and then had breakfast on arrival. It worked out OK but wasn’t ideal. Changi is a great airport for fast transfers and has the excellent new Qantas Lounge for Qantas Club or Qantas status flyers – British Airways Business Class travellers are herded toward the under refurb ex-Qantas First Lounge but the new Qantas lounge was leagues ahead in terms of food and style. The downside of Changi though is it’s reprocessing of passengers at each gate, where you have to clear security and a passport check and then wait in a holding gate before boarding can start. If you don’t time your gate arrival perfectly – which means waiting in the lounge longer than you’d think would be possible – you are left standing at the gate waiting for the aircraft to board. It’s a bit of a waste of time. Thanks to the 5am-ish arrival in London, I was looking forward to having access to British Airways arrival lounge at Terminal 5. 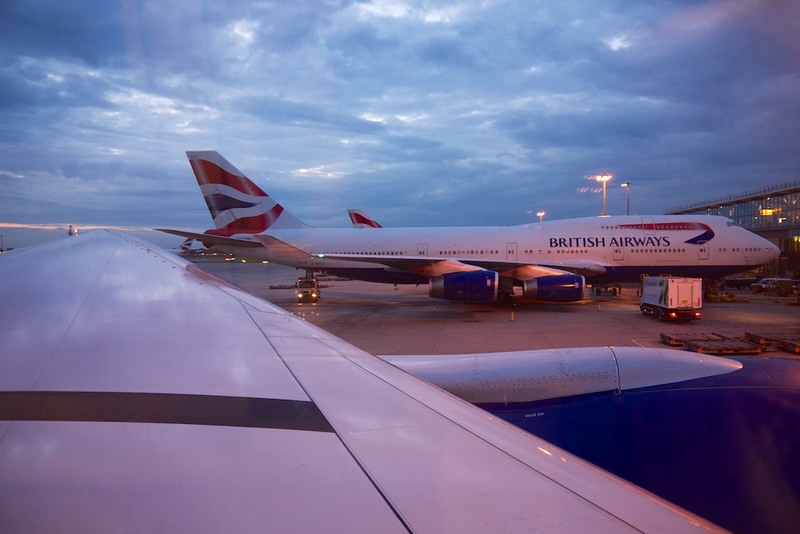 This is immediately after you’ve exited customs, upstairs on the landside of the terminal, and is only available to British Airways Business or First Class passengers – no general admission through oneworld status. I’ve previously been really impressed by Cathay Pacific’s similar concept in Hong Kong, which is a small lounge but well equipped with table service meals. 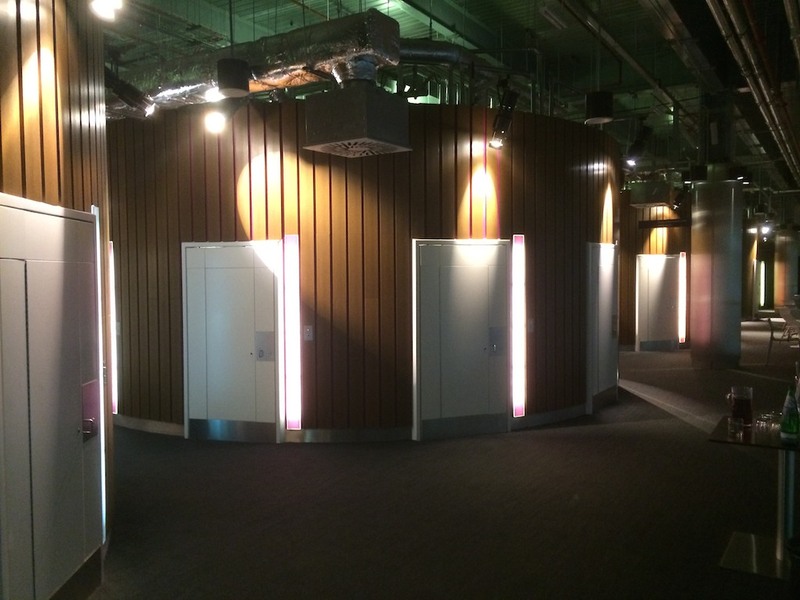 British Airways lounge is a bit more functional, and I wasn’t particularly impressed – there was a lot of space but the bathrooms felt like I was using a bathroom in a backpackers with acres of easily cleanable and functional plastic, and little design thought. 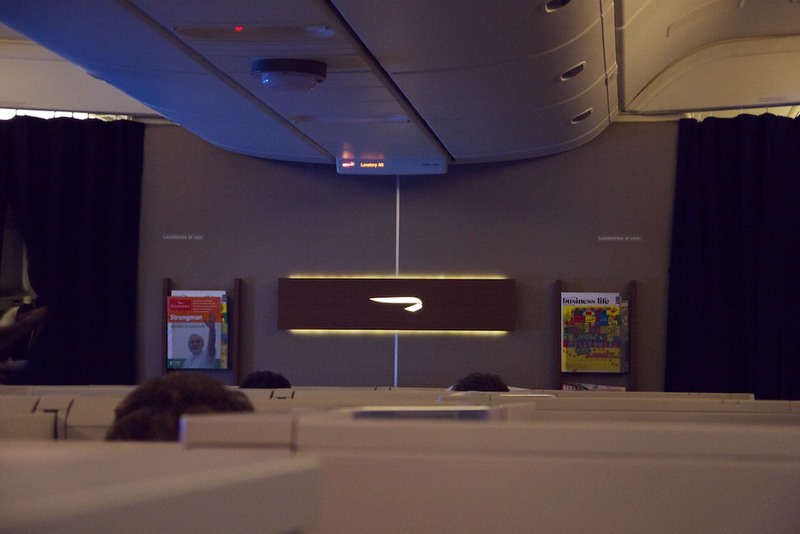 At this point, I then spent a few days in the UK before heading off to Oslo – more on those flights in another review. I arrived into Heathrow directly from Oslo, with 3 hours to spare before the onward flight to Singapore and back to Sydney – with a 9pm departure. The transit process at T5 is pretty straightforward and well-signed. I found the British Airways agents who I asked about various requests on seating and possible upgrades to First (more on this below) very helpful to deal with, and then headed off through security quickly to the lounge. It was really straightforward, and I’d have no hesitation about using T5 to transit if it were a concern for any reason. 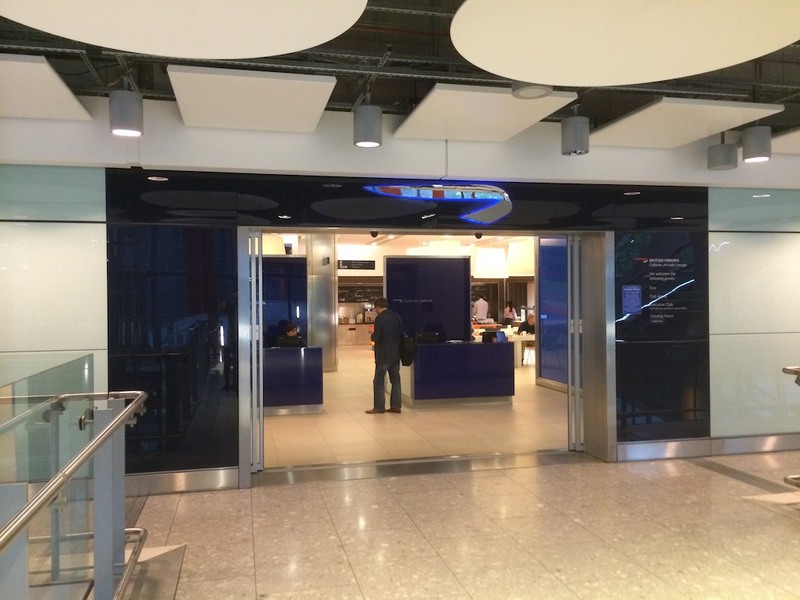 I’ve previously written up my thoughts on the British Airways Terminal 5 lounges and not much has changed. 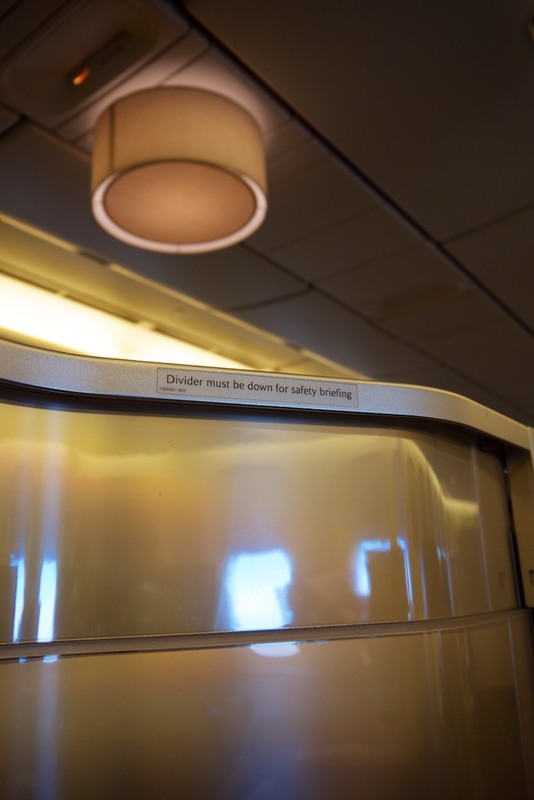 Like pretty much everything about my British Airways experiences, everything is all up to a certain standard and very consistent – I just wish that standard were a little higher. 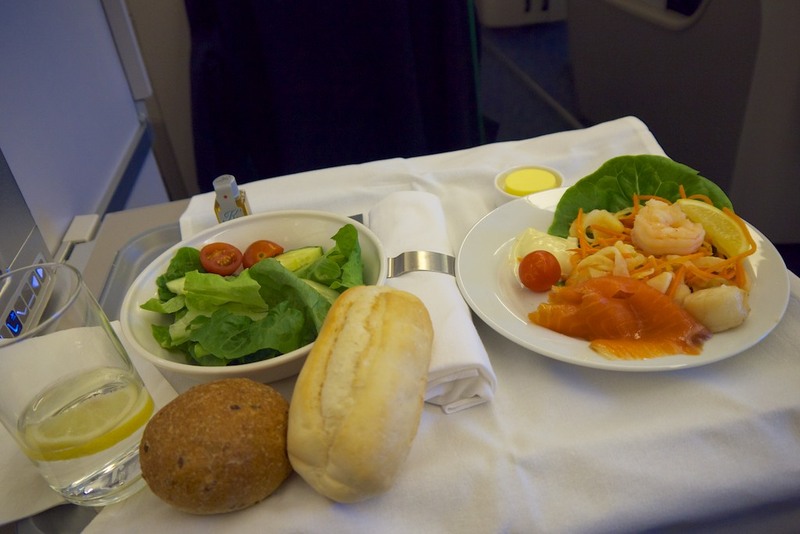 The food in the lounge was fairly straightforward and not too appealing, but I filled up anyway, thinking I would try and maximise sleep on both flights by passing on the dinner service. I also used the lounge to enquire about an upgrade to First, as I understood that British Airways often offer paid upgrades on departure if there is space available. This was offered to me at £599, and although I was pretty tempted given the 23 hour long nature of the journey, I passed. 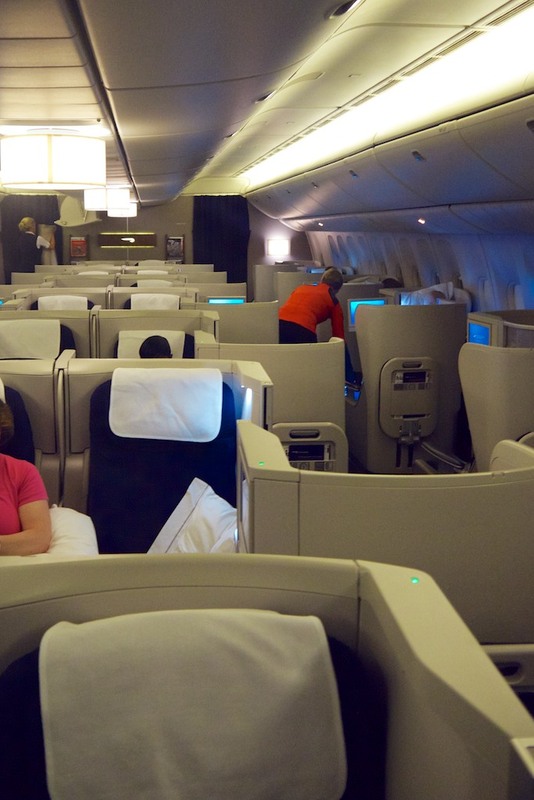 I regret this to be honest, I probably won’t have a chance to fly British Airways First Class in the near future, and for the length of time I’d get to spend in First, this was a pretty decent price. For my return flight, it again looked like the seat map was relatively blocked out, and I was again left with an aisle seat in either the centre or left hand side of the aircraft. 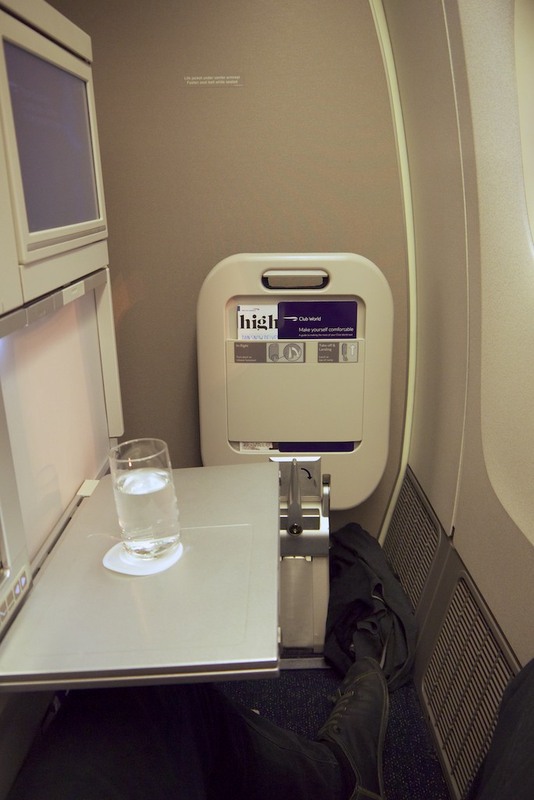 On arrival to Heathrow in the Transit area I began asking about seat availability, and fortunately one of the best seats in Club World had opened up. I managed to snag 16A, right at the back of the cabin, which is almost like a private mini suite with noone to step over to get out of your seat. As I said before, with the aircraft wall next to you you can splay your stuff out more freely than sitting in the aisle. I was pretty happy to get this all the way to Sydney. 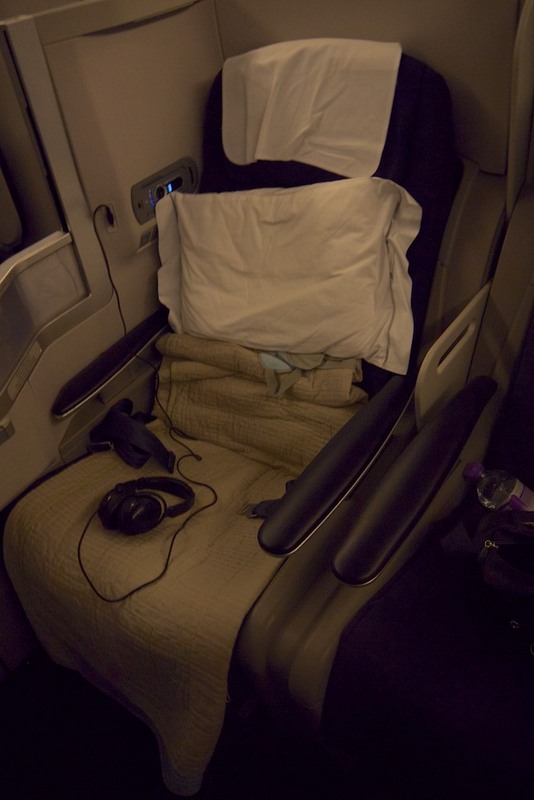 These pictures of the seat were taken after waking up somewhere mid-flight, with a bit more light. You get a better idea of the kind of privacy afforded by row 16. It’s worth seeking out. On the flight from Singapore to Sydney the aircraft emptied out significantly, with probably only 1/2 of the Business cabin seats full. After takeoff I spotted that the middle seats in row 16 were open as a pair, and with noone sitting on either side of them too. I couldn’t resist moving over to 16E to make the most of a group of seats that would have no interruptions from any service or other passengers, as well as to avoid the limited width of 16A (the downside of sitting next to the wall means you have a hard barrier to spreading width wise. It was a good decision, and I slept really solidly on both legs. I also timed my eating completely differently to the service on offer, which was another great way of getting back onto Sydney time much more quickly. More on that below. I was really beat after being in Europe for only 4 days on the ground. The whole ‘getting light at 3am in summer’ thing in Oslo also threw me, so for this flight I made a really conscious decision to try and time my sleeping and eating to work to set me up for a good recovery in Sydney. I figured the key was that I had to cram in a night, a short day and then another night into the 23 hour journey, to then arrive in Sydney at 5am. To do this, I ate in the lounge in London before the 9.30pm departure. 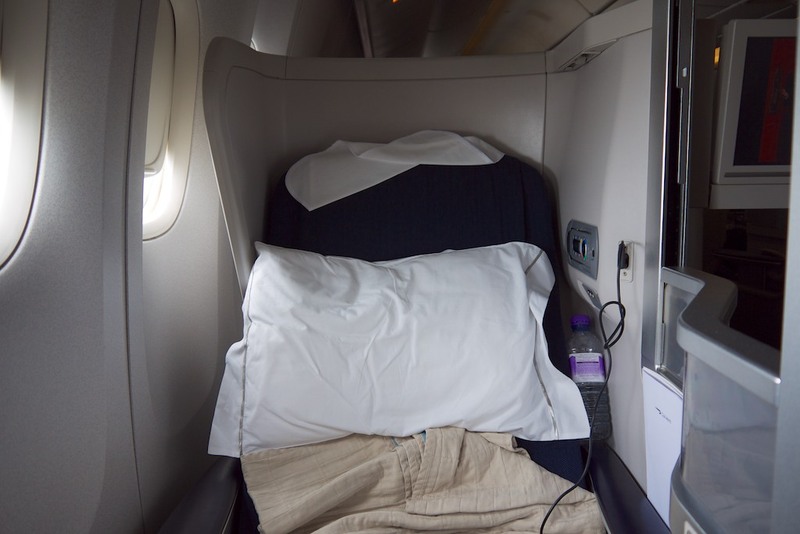 I then declined the dinner service and got straight to sleep, waking up around 6 or 7 hours later – about 2/3 of the way through the flight to Singapore from London. I then was awake for a few hours, grabbing a snack, and then breakfast (which acted more like lunch) from the leftover food available. 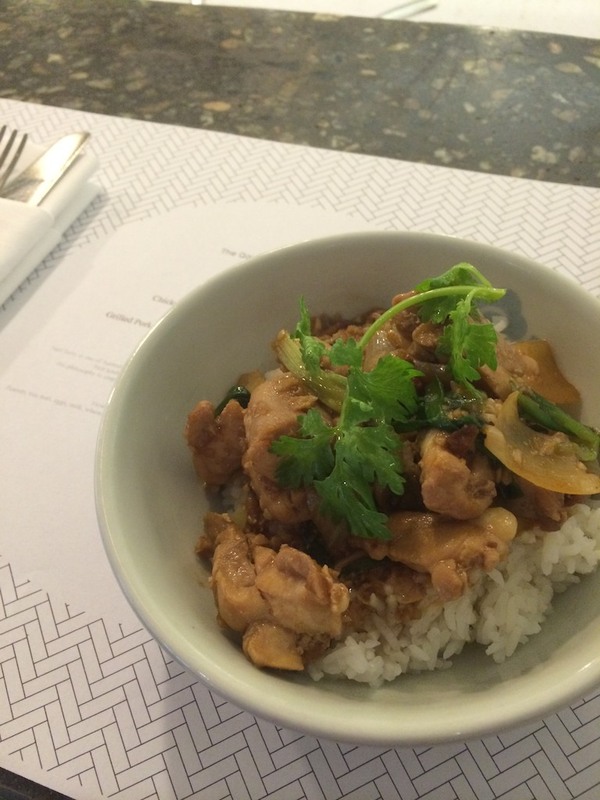 From there, after landing I grabbed a freshly cooked dinner in the Qantas Lounge in Singapore. 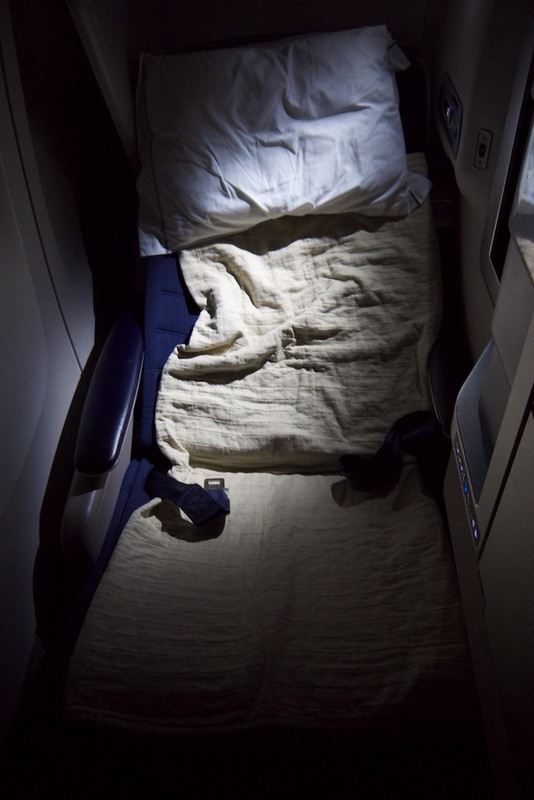 Then, I headed off to do the same again on the evening departure out of Singapore – straight to sleep, declining Dinner service (and maximising the use of Business Class seating). I got another 5 or 6 hours, waking up just in time for breakfast somewhere above Australia. I found all the British Airways crew that I interacted in were pleasant and efficient. I had no negative interactions with any of them, but then no outstanding ones either. They mirrored the rest of my British Airways experience in that way. The food was good enough, a bit hit and miss in places but all relatively tasty, filling and edible. 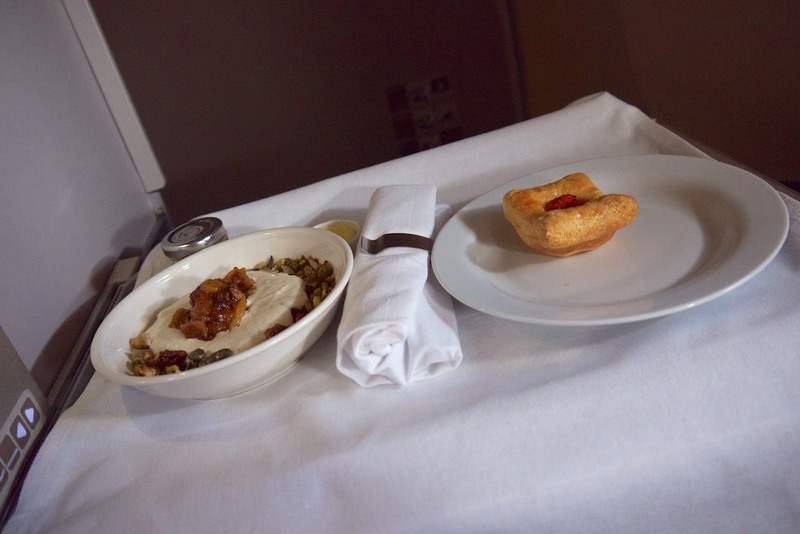 There were no real options for customising when you could eat without really stressing this preference to the crew – they served the meals and you got them when they were served, to the point where no mains were saved for passengers who didn’t want to eat immediately unless specifically requested. I found that a bit frustrating, and the crew on all stages felt a little put out by my requesting to eat when I wanted to, which I think is fair given such a long journey. British Airways met my expectations 100%. I knew I was choosing them for an efficient routing to London (more on my choice factors below) and Oslo, for a decent quality flat bed to get me there, and with a level of familiarity that I’d appreciate – for what was a quick trip, I wanted to minimise the unknowns. It’s a bit of a shame that the experience didn’t exceed my expectations, but at least it wasn’t below them either. In the oneworld camp, if I had a choice to fly Cathay Pacific, and probably Qantas, over British Airways, I would take others. But for this trip, this was the right choice. There was a strong possibility this trip was going to take place around 3-4 weeks before the travel date, and the days I needed to be in Oslo were very specific. This made research a much simple matter of comparing a set of routes, carriers, timings and to some extent, costs. The obvious starting point for me was to consider alliances in terms of getting credit for points and status for this trip. In my case, I’m still locked into Qantas and thus, oneworld for most of my travel, immediately excluding some available options – but that being said, Star Alliance routings weren’t particularly obvious anyway with a need to connect at least as many times as the oneworld options on offer. I also had the advantage of taking this trip in May/June, before the reduced Qantas partner status credit earn rates came into effect on July 1st. This upcoming change actually incentivised me to look away from Qantas for a new experience, knowing that I’d probably need to fly Qantas more in future to retain status. I also knew that I’d be travelling to London first, and then on to Oslo. I knew there would be one or more short connecting flights in here somewhere, and my preference is always to do these, where there is a choice, before the long haul trip rather than after. Spending a couple of hours in a short haul aircraft after around 23 hours of travel to get there is at the bottom of my list of things I like to do. That in mind, this left a pass across the options available from Qantas/Emirates, Finnair, Cathay Pacific, Qatar Airways and British Airways. I started looking into Finnair first, knowing that they codeshare with both Qantas and Cathay Pacific and the fact that Helsinki (their hub) is fairly close to Oslo. I’ve recently had a hankering to try them, with their new lie-flat Business Class product on many flights on the Hong Kong route (I checked the seat map for the dates I was travelling and it looked like a new configuration cabin), plus their design tie-ins with the likes of Marimekko. 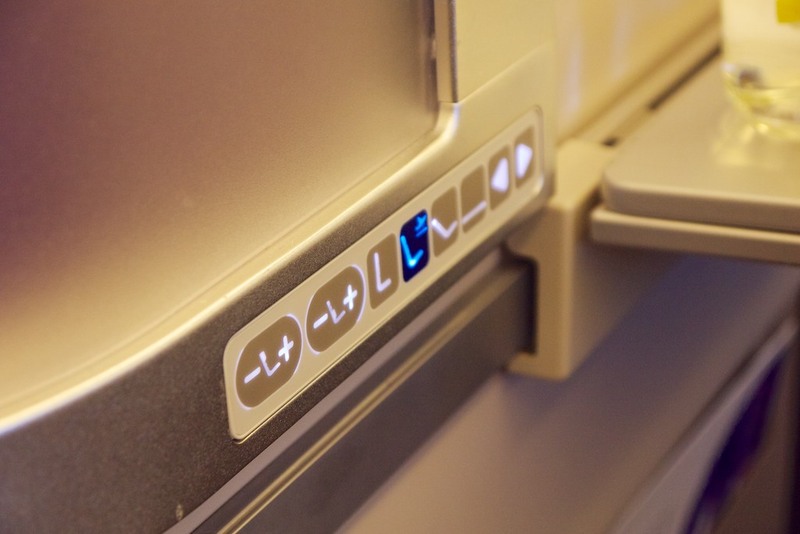 Finnair connect to/from Qantas and British Airways services via Singapore, and Cathay Pacific services via Hong Kong. This meant that I’d be looking at a routing of Sydney – Hong Kong – Helsinki – London on the outbound, a connecting flight to Oslo, then Oslo – Helsinki – Singapore – Sydney on the way back – a total of 6 flights, however the return would be slightly faster than some of the alternatives. Given Helsinki – London is around 3 hours, I’d be spending that long in a small single-aisle aircraft when I could instead be getting to London in two stops on Cathay, Qantas/Emirates or British Airways. 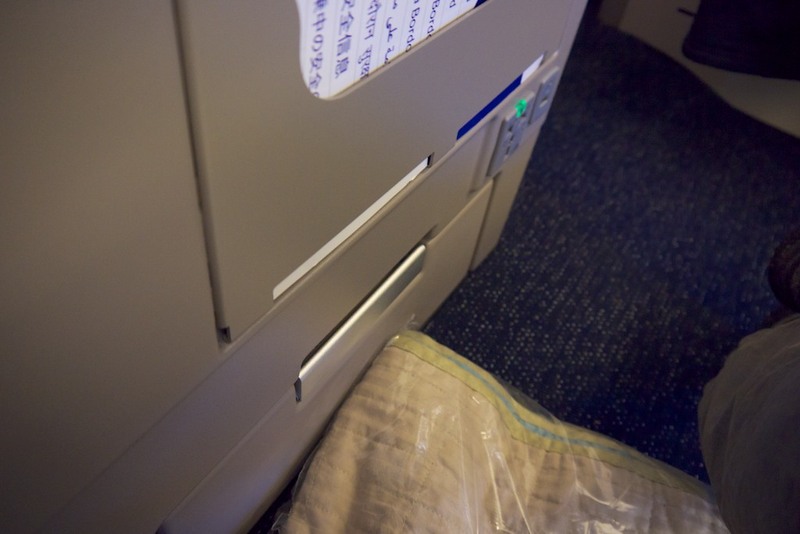 This somewhat ruled Finnair out unfortunately. If I weren’t travelling to London on this trip, they would have probably been my choice, especially given that I could take Cathay to/from Hong Kong as well. I ruled Cathay out almost immediately, being at least 30% more expensive than some of the alternatives on the route. I find this typical, unfortunately. Another option was Qantas all the way to and from London, with not too dissimilar flight times to British Airways – with QF1 an afternoon departure from Sydney, arriving in London the next morning, and QF2 an evening departure from London, arriving in Sydney first thing two days later. The itinerary worked for me, and I would have earned more points with this option, but I really wanted to travel with someone other than Qantas for a change. 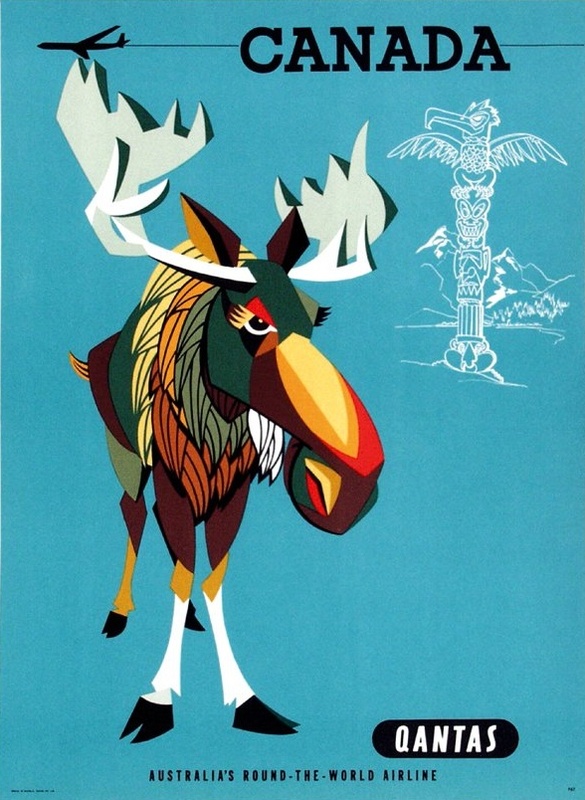 Another consideration was that connecting flights onto Oslo were also offered as part of the itinerary but they bumped up the cost significantly in Business Class, whereas British Airways were essentially throwing them in AND reducing the fare compared to a London direct flight from Sydney. This meant I would have to travel to/from Oslo in Economy on a separate ticket if flying with Qantas, which meant an unprotected connection on the way home, and fewer status credits. Emirates (booked as Qantas codeshares) was also an option, with similar flight times, but the same ‘issue’ with the connecting flight to/from from Oslo. Interestingly Emirates start direct service to Oslo very soon, and this would have been almost the perfect itinerary for this trip – Qantas to London, a hop to Oslo on BA, then Emirates to Dubai and back to Sydney. However, this was not to be. Qatar fly from Melbourne to Doha, and then connect very quickly on their new 787 service to Europe – including to/from Oslo. This would have me flying Sydney – Melbourne – Doha – London, and then Oslo – Doha – Melbourne – Sydney. 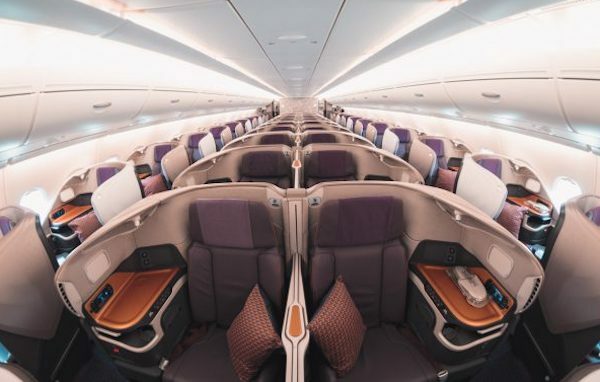 It seemed like a short connecting flight between Sydney and Melbourne in Qantas Business Class can also be included in the Qatar ticket for very little extra cost, and in some cases more cheaply to attract Sydney flyers. It would have earned me a few extra status credits, and given how familiar travelling with Qantas is between Sydney and Melbourne to me (and faster than travelling Oslo to London to connect), didn’t feel too arduous an itinerary to consider on the return flight. Unfortunately Qatar didn’t have availability for one of the exact dates I needed to travel, ruling them out (of course). Otherwise, I would have been very tempted given them a go, given the option of checking out their new 787 product as well. 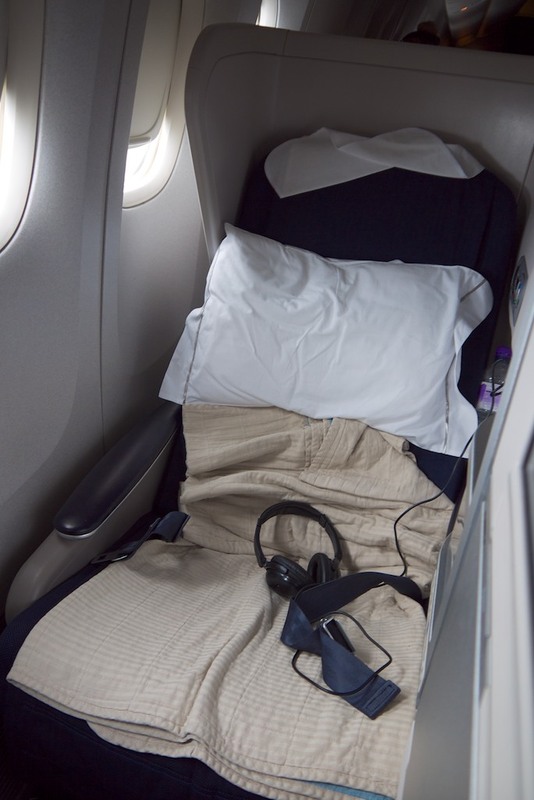 So, finally, why British Airways? It sounds like I looked into all options before settling on BA – but as you can tell, I’m just (too) thorough in my research before making a decision. I wasn’t actively looking to avoid them, despite having a particularly bad experience with them in Club World a few years back. 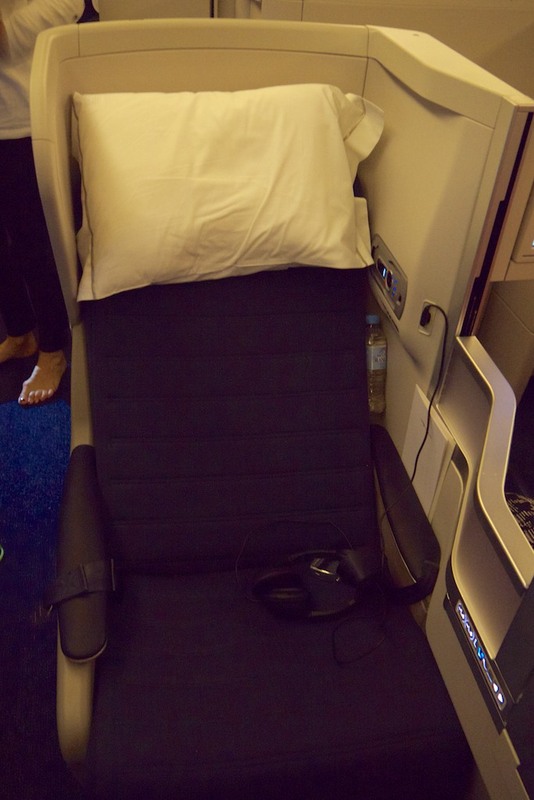 On running through all the options, the deciding factors were that British Airways offer a ‘good enough’ consistent, lie-flat bed Business Class all the way to Europe, with a fast transit and connection in Singapore, plus the included Business Class leg to Oslo and back – good for Status Credits and ensuring seamless connections in London. The fact that I haven’t flown or written about their 777 route out of Australia before, and the upcoming change to Qantas partner status credit earn, all pointed toward British Airways being the right option for this trip. I’m sorry, but I can’t agree that it’s “fair” for the cabin crew to feel put out to get you food when you miss the regular meal slots. 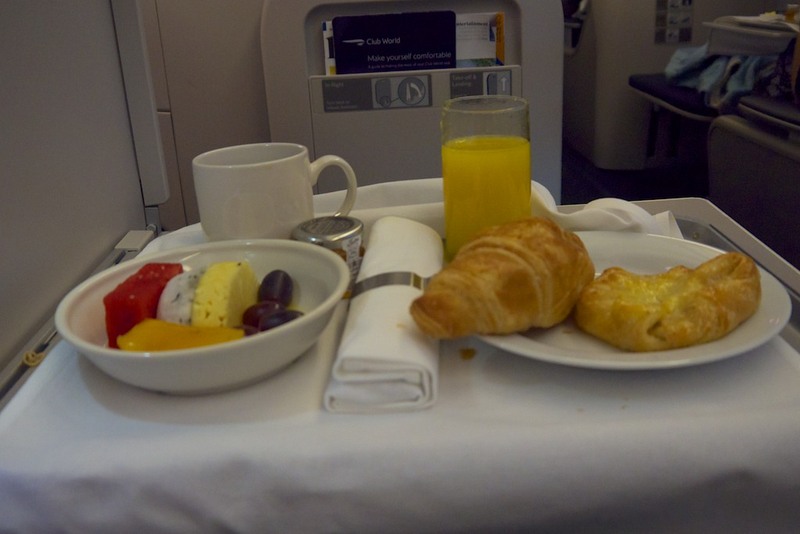 A business class fare is expensive enough to expect that the staff will do their best on service. So they’re put out that they have to stop their conversation with a colleague for a few mins to warm up your food? With respect, who cares!! Get me the damn food pronto. PS great review. But only reinforces my opinion that SingAir’s business class is the best I’ve flown. Huge lie flat seats, amazing food (4-5 courses!) that is worth staying up for, and impeccable service. Thanks for the insight. I think my comment on it being ‘fair’ was that they kind of warned me that trying to eat at a non-service time would cause problems, but it wasn’t clear. And yes, thoroughly agree that having to eat when told isn’t up to standard. can you tell me what you can exchange your enrich points for? 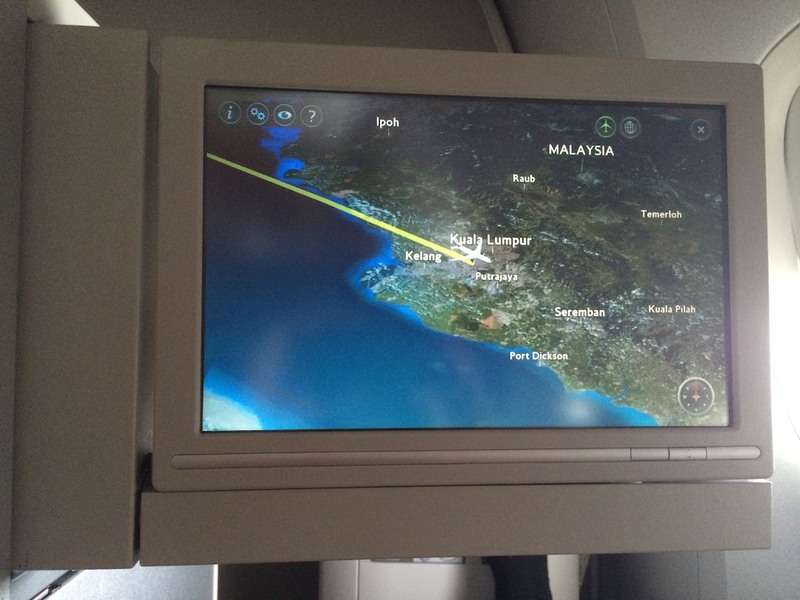 Best value is for flights on Malaysia Airlines. You get what you pay for, but BA’s product there looks so substandard when compared with Cathay, the 30% premium appears a bargain! Btw, SIA will definitely blow you away, if you can get over the very minor inconvenience of flipping the seat to convert into a bed. Makes that business aisle seat on BA feel like Jetstar in comparison. Is this new? I thought all one world business class passengers can access Qantas lounge in Singapore (when it opens)? I would imagine they would have access through being a Business passenger on a Oneworld operated flight.. This was a comment made to me by the Qantas lounge staff, which may be wrong, I forgot to look into it. Given I’ve had oneworld status for a while I haven’t looked into it for a while, and reading the oneworld lounge terms, I think you could be right – doesn’t seem to be exclusions based on operating carrier that I could see. 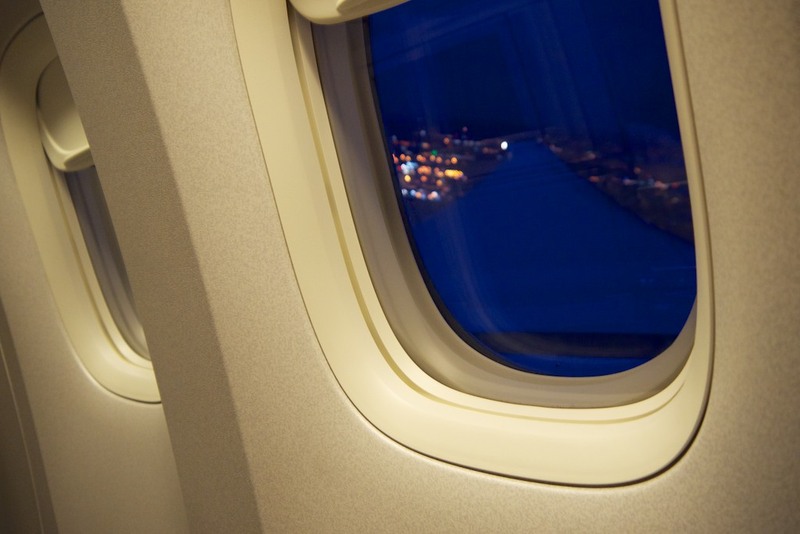 Who are the best airline you’ve flown with? Or best overall experience? 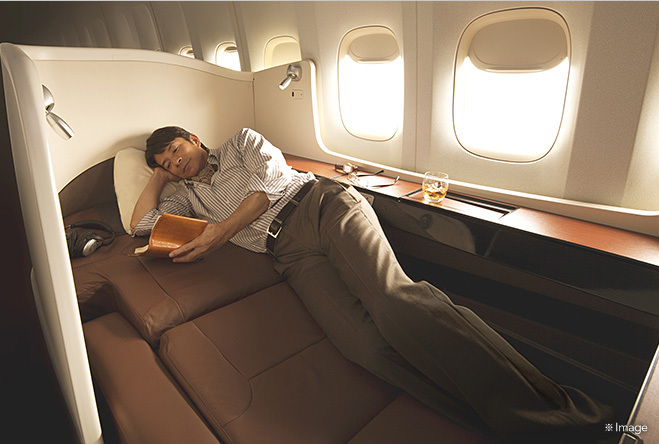 I’m a big fan of Cathay Pacific’s Business Class. Great seat, good entertainment, friendly crew. But I’m not actually that experienced, I am far from having flown all the best products in the region – I’m yet to try Singapore Airlines or Emirates, for example – but plan to next year. I have a suspicion Singapore may blow me away a bit.